The Blues won every quarter and controlled the majority of the contest to record their first win of the season, by 44 points. 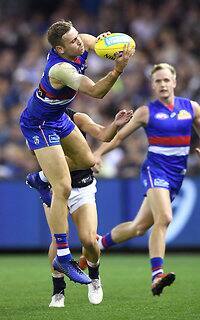 The Dogs trailed by four goals at three quarter time, but conceded four of the last five goals of the game. 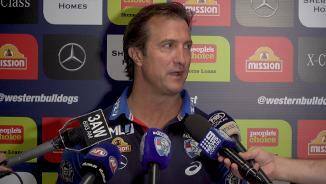 Inaccuracy and missed opportunities were once again the Bulldogs’ achilles heel, in what was the team’s most disappointing performance of the season so far. The Bulldogs were outplayed for most of the first half, but trailed by just 19 points at the main break. Despite a chance to reset, the Blues slammed on the next two to storm out to a 30-point lead. Then, the momentum changed, and the Dogs came hard, kicking the next two. But an intercepted kick across the Bulldogs’ defensive 50 handed the Blues a gimme goal which knocked the stuffing out of the comeback attempt. Will Hayes was impressive in his first AFL game, collecting 21 disposals. He started with nine touches in the first term, and his hard running was a feature throughout. 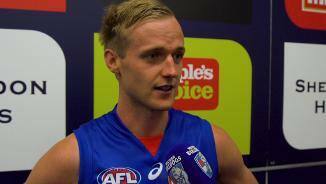 Caleb Daniel and Jason Johannisen were at their industrious best across half back, while the Dogs’ other debutant Lachie Young showed plenty of promise. 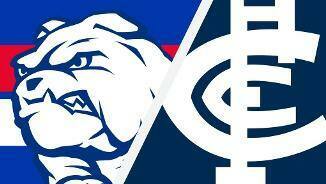 The Bulldogs’ clearance work has been their biggest strength so far this season, but against the Blues they were beaten by 16 – by five at the centre bounces and 11 around the ground. 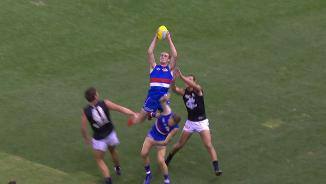 The Dogs were also shaded on the outside, recording 43 less uncontested possessions and 28 less uncontested marks. Daniel was the biggest ball-winner in a losing side with 31 disposals, at 83% efficiency. 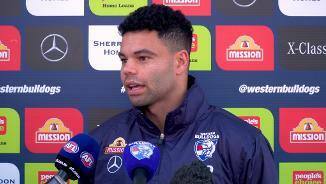 Johannisen recorded 26 touches and Marcus Bontempelli finished with 24. Despite going down by 44 points, the Bulldogs finished the game with six more inside 50s. 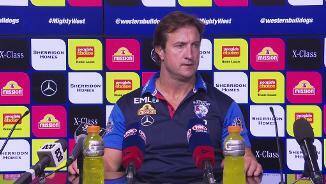 Western Bulldogs: Daniel, Johannisen, Bontempelli, Macrae, Crozier.